On September 17, 2015, Capalino+Company’s MWBE Consulting Group joined the Brooklyn Chamber of Commerce’s MWBE Committee Meeting as part of an ongoing collaboration to provide support, guidance, and services to their members. The MWBE Consulting Group, which includes Senior Vice President Tunisha W. Walker and Special Projects Strategist Safeena Mecklai, has been working with the Chamber to build their capacity and resources to serve the needs of their MWBE members. This meeting, which included an insightful presentation and one-on-one meetings, aimed to provide real solutions and strategic advice for MWBEs as they work to obtain public and private contracts and grow their business. It was an opportunity to provide our expert MWBE services to the Chamber’s attendees, teach them about doing business with the public sector, and share best practices. 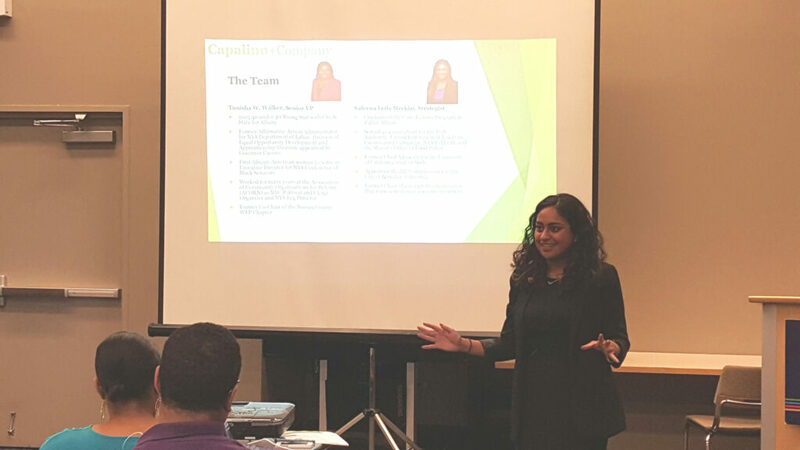 Tunisha and Safeena gave a brief history on MWBE goals and procurement in New York City and New York State, outlining the goals of Local Law 1 of 2013 on the City level and Article 15-a at the State level, both of which consist of public procurement goals for MWBE businesses. 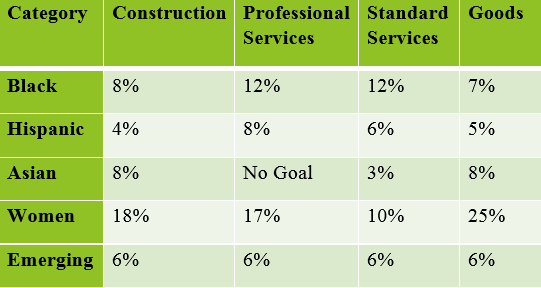 The State’s current MWBE procurement goal is 30%, while the City’s goals vary by minority group and type of contract, as can be seen below. The Capalino+Company team took questions from the members on City and State certification, City and State goals, RFP-writing, and the difference between sub and prime contracts. “We are looking forward to helping members of the Chamber’s MWBE Community, looking at ways we may be able to work with the Brooklyn Chamber of Commerce as a whole”, said Safeena Mecklai. Founded in 1918, the Brooklyn Chamber of Commerce promotes economic development across the borough of Brooklyn and advocates for its member businesses. The Chamber ensures a healthy and robust business environment throughout Brooklyn. The MWBE Committee is made up of members of the Chamber who are or would like to be MWBE certified, and meets to share resources and best practices for MWBE businesses in New York City. Capalino+Company launched the MWBE Consulting Group in order to match the growing attention, demand, and regulations on MWBEs in the last decade. Tunisha and Safeena were thrilled to meet with chamber members and offer support, guidance, and services for them to grow their business and make them great candidates for public and private contracts. If you’re interested in learning more or arranging a presentation for your organization, please contact Tunisha here.